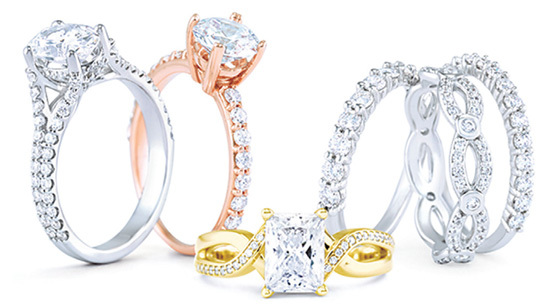 Rose Jewelers is proud to be Kalamazoo’s engagement ring specialists since 1980. Our engagement ring process is a little different than that of a traditional chain store. We help you design the perfect ring, and you have over 40 years of experience in the jewelry industry to help guide you. We aren’t going to try and sell you, we are going to educate you and let you make an informed decision. What we provide is our insight as to the plus’s and minus’s of certain styles, experience in finding a quality diamond that is going to shine regardless of budget, and the ability to customize the already 1000’s of designs we offer to meet what you really have envisioned. Know that when comparing apples to apples, our prices are going to be hard to beat. This is simply because we do not have the overhead that the larger stores do, and we don’t push the extra’s. It’s just two guys doing what they do best. When we give you a price, it is going to be cost of the product. There won’t be added costs for cleaning, sizing, warranties, soldering, or any of the little nickle and dime items that the big stores offer. The cost of some warranty’s can be more than the cost of repairs of the ring over it’s entire lifetime! And if something is wrong, or needs to be fixed, there is no month long waiting time since the work is performed here in house. So rest assured you are in good hands. We try to keep the process simple for you. We do ask that you come prepared with a few details if possible to help with the decision. Stone shape, Stone size, and metal property. From there we will guide you to the perfect ring. Click the picture to browse our online inventory. Step 1. Choose a mounting: We’ve got thousands of options for you, and all of them can be adjusted and customized to meet your vision. Whether you have no idea what your looking for, an idea in your head, or have 3 pages from pinterest that could all be winners, we can accommodate your needs. Our mountings come from top quality US based companies that follow the strictest guidelines to ensure you get a piece that will last without worry. Or if you prefer, we can create one right here at the shop for you to give that fully personal, one of a kind, design. Step 2. Choose a stone: This is where we stand out. We get our stones from wholesale vendors all over the nation, and use our knowledge of diamonds to do the shopping for you. Once we narrow it down to just a few stones we deem worthy of the ring, we’ll have you come in and we will explain the differences in the diamonds, which we suggest, and why for your particular mounting. Even if you’ve found a mounting somewhere else, we can provide you a top quality diamond at a fair price and mount it for you. Step 3. Match a band: Most of our mountings already have a band that is designed to match up perfectly with the engagement ring, but if you have other ideas we can gladly accommodate. Whether your looking for a simple gold band to add some character, or a diamond band to accent the center stone, we can make sure that the completed set looks perfect when finished up. And when you buy a band from Rose Jewelers we solder them together for you after your wedding at no charge. 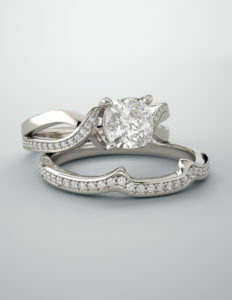 Click picture to view our wedding band selection.